-I was on the bus, basically, for 12 plus hours, going from Syracuse, NY to Richmond, VA via Greyhound on Wednesday May 30, 2018. The days are actually kind of a blur for me. The first two days we spent re-shooting a lot of the stuff that we’d done the previous time I was here. While it was good, there were some things that had to be fixed / changed so they were just re-shot. They all came out better than what was originally done. 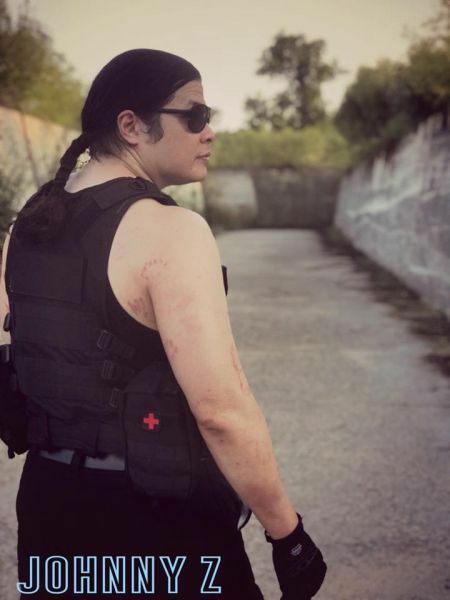 I got even more bruises on both arms from fight scenes with Feliz Cortes and Jason Delgado-as well as numerous scratches on my arm from the aluminum knife Felix was using-which is a good indicator of what would happen in a real knife fight. Then I had to do some more physical stuff. I can’t give any details away, obviously, but this was some intense stuff. I’m glad I had some padding to land on (even though there were times when I wasn’t suppose to fall but did anyways) and my knee is eternally grateful for the hard shell pad I had on it or I’d have a shattered kneecap right now. A number of the things done here were things I’d never done before (or, if so, with much more intensity) so that was quite the experience. An example is slamming into a wall ful force a few times-the last of which did some damage to the wall and myself (I got a video of that and I can post it so that’s forthcoming…). I got to see the playbacks on most of the takes and I can’t wait till you guys see this. The most intense of all this was on the last day when we didn’t start leaving the house till around 11 AM-a totally exhausting and draining day of filming, but everyone pulled thru and we got it done. At that point, I was such a mess-FX artist Marcus Koch said I’m the sweatiest person he’s ever worked with. I mean, I was drinking bottles of water for hours, yet not needing to go to the bathroom at all-that’s how much I was sweating. We also did some outdoor shooting earlier in the day before all that. -I had an awesome time and learned quite a lot of stuff. The cast & crew here were wonderful. The extra emphasis on safety was great (although-true to form-I managed to unintentionally break some stuff). It’s too bad there wasn’t a behind the scenes camera rolling throughout-especially on that long final day. That would’ve been fun to look back on-especially with what I had to do at the end. Second block coming up-I have some quick shots to do and I’m done. Big thanks to everyone on this project for your support and special thanks to director Jonathan Straiton for giving me the opportunity to be on this film. Everything that I’ve seen so far on this is, IMO, on a much higher level than NoSS and I’m grateful to have been a part of it. -Pics can be seen on my acting page on Facebook. This entry was posted in ACTING, FILMS and tagged Felix Cortes, horror, horror film, horror movie, Hurricane Bridge Entertainment, Jason Delgado, Johnny Z, jonathan straiton, Marcus Koch, MARTIAL ARTS, night of something strange, NoSS, Wayne W. Johnson Acting, WWJ, zombies. Bookmark the permalink.